Publication Data: Originally published 1940, Collins Crime Club (UK), no ISBN. This edition, trade paperback, Ramble House, 2009. ISBN 9781605431901. This is an Inspector Beale mystery by an author whose work is so scarce, it is nearly legendary — Rupert Penny (pseudonym of Ernest Thornett). Apparently he was only published in small-run fragile wartime editions in England and reprinted in small-run fragile paperbacks in Canada and Australia, all associated with the “White Circle” imprint. But it is not merely scarcity that he has to recommend him, it is a certain indefinable quality of — loopiness. They have found a home in reprint recently with Ramble House, and I have to say it’s a natural fit. Ramble House is the champion and archivist of Harry Stephen Keeler, the loopiest of them all, and they seem to cherish old mysteries and crime fiction with a certain bizarre je ne sais quoi. The loopiness comes in many forms. For one, Penny was a constructor of bizarre plots that involved the classic locked room/impossible crime format. But his mysteries always have a strained air of “constructedness”, where the plot must go in odd and unbelievable directions and the characters strain credulity in order to generate the situation where the corpse is found in that impossible situation. John Dickson Carr, the acknowledged master, did it with a whiff of the supernatural and determinedly ordinary people caught up in circumstances beyond their control. Penny, I suspect, started with the end and worked his way back to the beginning as best he could. Another major source of loopiness is the novels’ determination to present England, the land of stiff upper lips, hearty matrons and “jolly hockey sticks”. The novels are so embedded in the English milieu that they frequently veer over the line of inadvertent parody; what a friend once described as the “three pen’orth of chocs a fortnight come Michaelmas” school of writing. Penny is constantly trying to present character through word choices in dialogue, usually a good idea, and one needs to be a master of the English idiom to follow some of the nice distinctions he is making in social class and education. And the loopiness extends to the further reaches of the more unusual formats of publishing detective fiction. Penny novels frequently have maps, charts, and diagrams, and the conceits extend to the inclusion of an Ellery Queenian “Challenge to the Reader” in each novel, whereby the action stops, the fourth wall is broken, and the reader is invited to agree that at this stage of the game he has enough information to conclusively solve the mystery. So, with the imperfectly-described quality of oddity in place, this offering takes place against the backdrop of a quintessentially English prep school. An unusual technique is employed, in that the murder is delayed until perhaps the middle of the book; the first half is spent establishing the territory and the characters. I have to say, it is not time wasted. I am occasionally the type of reader who wishes that an author would quit with the precious description of the countryside and just get on with the bloodbath, but here, as always with Penny, I was content to enjoy the quotidian workings of a veddy Briddish prep school and enjoy the plot’s knots constricting slowly. To boil it down: the headmaster has a favourite boy, a rather senior one in the school’s hierarchy, whom he forgives offences and defends against criticism by other masters and students. The Head is himself no prize (he’s a petty martinet), nor is the slovenly school, and the staff members have a number of legitimate axes to grind against management and organization. The favourite boy is a greedy brat who stuffs candy into his mouth at any and every opportunity, and the reader is not surprised when he is found dead beside a poisoned block of chocolate-covered marzipan. There is much who-would-have and who-could-have in the next chapters, but it becomes obvious that the crime is quite impossible; those with motive have no opportunity, and vice versa. Inspector Beale must work out the crime that was supposed to have happened before he can truly understand the murder that occurred, and when he does so, the murderer confesses and the book is over. Some will call this a “trick”; to my mind, it’s the kind of thinking that would be needed in a situation like this, that is elevated above the Miss Scarlet in the Conservatory with the Lead Pipe type of problem. Essentially, something went wrong with a clever plot, and this unusual thought process is what would be required in the real world to solve such a problem. Admittedly, there are the trappings of unreality, but the core of this book is perhaps what would actually happen if the police were confronted with a situation as unusual as this. I suggest that you’ll find this book extremely satisfying if (a) you are an aficionado of the Golden Age puzzle mystery and are running out of new masters whose work you can enjoyably explore; (b) if you like a good old-fashioned British mystery where the aristos frolic immorally and the lower classes tug their forelocks, until the clean-limbed Scotland Yard man saves the day; (c) if you like really difficult mysteries that you can actually solve, rather than just guess at the answer, and (d) if you want to be the envy of your bibliophilic friends for not only having heard of this little-known author but actually reading his work. It will help you to have the ability to suspend your disbelief even more than average. Other than that, I cannot recommend that you spend your money here; it’s rather like ancient Scotch or Nova Scotia Malapeques, an acquired taste. Notes For the Collector: There are only nine Penny novels and, before the reissue of most of them by Ramble House recently, reading more than half of them would have been the effort of a lifetime due both to scarcity and sheer expense. Years ago, a couple of times I paid outrageous prices to purchase a Penny novel only to sell it in as soon as I’d read it a couple of times; I literally couldn’t afford to keep it. 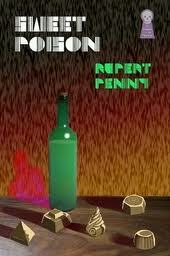 Ramble House, a very interesting publisher, has brought out trade paper editions of most of Penny. I purchased my copy of Sweet Poison directly from Ramble House a few years ago and recall that after exchange, Customs tariffs and delivery charges, it worked out to be about $30 (Canadian). I note that there are two copies available on abebooks.com, starting at about the same price, and an original Australian paperback using the White Circle marks at, wait for it, $250US. And as for the first edition hardcover? Fuhgeddaboutit. I can’t even tell you what one would bring these days, but the last time I saw a good Penny first for sale, it was in the $750 range. Essentially the old paperbacks are worth what many first editions are worth, and the first editions are worth — your firstborn or thereabouts. Now that most of these are available in Lulu-based editions, they really are the price of a current best-seller first edition at a bookstore, which is a significant achievement in making this author available to a wider audience. Those of us who are fans of good old puzzle mysteries have good reason to thank Ramble House for this and a whole lot more. My experience is that any copy of a Rupert Penny novel is worth pretty much what you have to pay for it (that is, if the pages aren’t actively falling out, etc.). If you are a bookseller, believe me, it may take a few years but someone will always come along and give you twice what you paid for it. And if you merely like to read good old mysteries, you will have the pleasure of knowing that for once in your life you will be able to sell the book when you’re finished for at least what you paid for it and probably more, if you are in touch with a knowledgeable bookseller or know your way around the internet. This entry was posted in Detective fiction, Mystery, Novel and tagged Ellery Queen, Harry Stephen Keeler, impossible crime, Inspector Beale, John Dickson Carr, locked room mystery, puzzle mystery, Rupert Penny.